This midsize sport-utility vehicle gets a significant overhaul for 2014, with fresh styling inside and out, a different engine, revised chassis, and new safety and convenience features. It’s the first major update since its model-year 2011 redesign. Why should I buy the current 2014? Get out your checkbook if the ‘14 Sorento interests you: is no major revisions are expected for the next several years. The only substantive changes for model-year 2015 are minor appearance tweaks, maybe some features shuffling — and higher suggested retail prices. This is the South Korean company’s best-selling SUV and typical of Kias, boasts lots of features for the money and one of the industry’s best warranties. Should I wait for the 2015 model instead? If you think small changes will make it better and are worth the extra money – even though you won’t realize much if any difference between a ’14 and a ’15 come trade-in time. Note that Sorento shares some elements of its basic design with the Santa Fe crossover from Kia’s corporate parent, Hyundai. Both offer a choice of two-row seating for five passengers and three-row accommodations for seven. Kia, however, chooses to squeeze a tiny third row into the standard Sorento body. Hyundai, by contrast, fields two Santa Fes, the five-passenger Sport, which is the same length as the Sorento, and a longer, roomier seven-place version called just-plain Santa Fe. This won’t change for 2015. 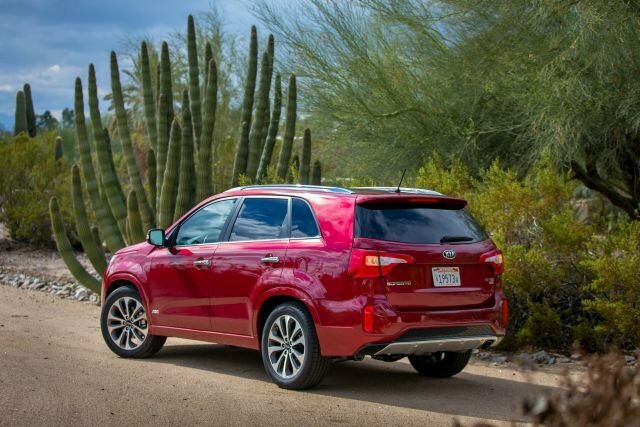 Despite considerable engineering alterations, the latest Sorento doesn’t look drastically different than the 2011-2013 generation, and its dimensions are almost identical, including the same 106.3-inch wheelbase (distance between the front and rear axles). The transformation was more radical inside, with a new control interface and instrumentation and improved materials quality. Still, designers already seem restless to update the styling for a more aggressive look. Subtle revisions to the brand’s “tiger-nose” grille and front bumper are likely for model-year ‘15. Meanwhile, the ’14 lineup reprises base LX, volume EX, and sporty SX trim levels. Added is the Sorento SX Limited (SX-L). 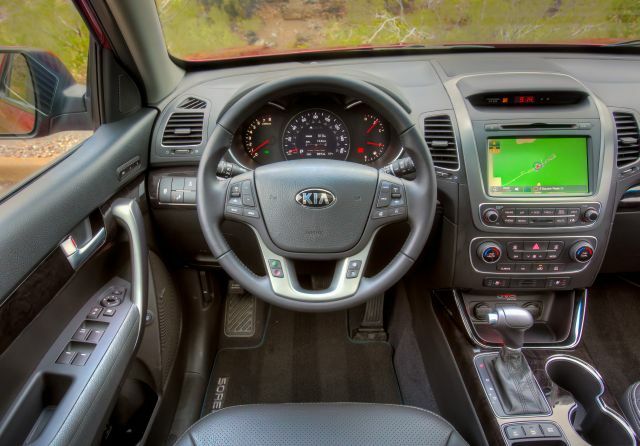 Inspired by the success of the SX Limited version of the automaker’s Optima midsize sedan, it has upscale amenities designed to attract shoppers who haven’t considered a Kia. More than meet the eye. The chassis is all-new and more rigid. It combines with a re-engineered suspension for improved ride and handling and less noise and vibration. Weight and drag on the engine is reduced with introduction of electrically assisted power steering in place of a hydraulic system. Standard on SX and SX-L is the carmaker’s FlexSteer that lets drivers toggle between Comfort, Normal, and Sport steering firmness. A six-speed automatic is again the sole transmission and all models remain available with front-wheel drive or extra-cost all-wheel drive (AWD). The previously optional 2.4-liter four-cylinder is now the base engine. It produces 191 horsepower and is available only on the LX. All other Sorentos again have a V-6 but it’s a new 3.3-liter with direct fuel injection and 290 horsepower. It replaces a less sophisticated 276-horsepower 3.5-liter. There is no Sorento hybrid model. All versions do have alloy wheels, an antiskid system, and four-wheel antilock disc brakes, with 19-inch chrome rims and red-painted brake calipers and SX-L exclusive. Towing capacity is 1,650 pounds with the four cylinder and 3,500 with the V6. The ‘14 Sorento gets better mileage than its predecessor and has EPA fuel-economy ratings a little above the midsize-crossover average. With front-wheel drive, the four-cylinder LX rates 20/26/22 mpg city/highway/combined with front-wheel drive and 19/24/21 with all-wheel drive. V-6 versions rate 18/25/21 mpg with two-wheel drive and18/24/20 with AWD. This brand is known for equipping its vehicles with standard features for which rivals charge extra and with offering options unavailable on some direct competitors. That holds true here. For example, even the four-cylinder LX counts heated mirrors with LED turn-signal repeaters among its standard equipment. And — unusual for an entry-level model — a navigation system and rear air conditioning are among its options. A tilt and telescopic steering wheel, cruise control, power windows, locks, and mirrors, LED taillamps, auxiliary and USB iPod jacks, and Bluetooth hands-free phone linking also are included. Kia’s UVO infotainment system with eServices telematics, a rearview camera, rear-obstacle detection, rear-window sunshades, and heated front seats are optional on the LX and standard on the other grades. The rear air conditioning and navigation, along with blind-spot alert and a programmable power liftgate are optional on the EX and four-cylinder LX and standard on SX and SX-L – but oddly not available on the LX V-6. Cooled front seats and a power passenger seat are optional on the EX and standard on SX and SX-L. Offered only in exclusive shades of black, white, and silver, the SX Limitedt gets self-leveling xenon HID headlights, Nappa leather upholstery, a wood-trimmed heated steering wheel, heated second-row seats, and soft-touch head liner and pillar accents. The third-row seat is optional as part of a $3,000 package on the LX V-6 and a $1,200 package otherwise. On EX trims and above, the center gauge cluster features a 7-inch thin-film-transistor (TFT) liquid-crystal display (LCD) that projects a digital speedometer flanked by analog tachometer, fuel- level and coolant-temperature gauges. The TFT LCD readout also displays trip and vehicle information, along with navigation updates. The new center control stack accommodates an optional 8-inch touchscreen integrating navigation, SiriusXM satellite radio with real-time traffic updates, a premium Infinity audio system, and UVO. Other newly available features include this carmaker’s first-ever programmable power liftgate, a panoramic sunroof with a power shade, and a 115-volt household-type power outlet. This crossover is also the first Kia to offer a blind-spot detection system. How will 2014 prices be different? They increased by more than $1,000 over comparable 2013 Sorentos. And addition of the SX-L pushed the base-price ceiling above $40,000 for the first time. 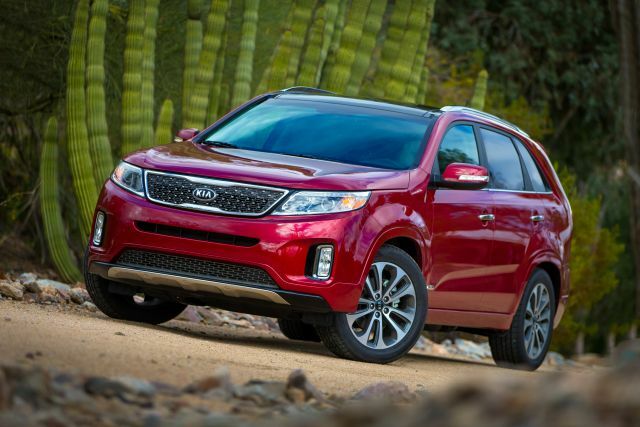 But Sorento remains attractive if you like lots of features for the money and love the security of the 5-year/60,000-mile bumper-to-bumper warranty and 10/100,000 powertrain coverage. Base prices in this review include the manufacturer’s $895 destination fee. They begin at $24,995 for the four-cylinder LX with front-drive and $26,795 with AWD; add $1,600 for the V-6. Most buyers will opt for an EX; it starts at $30,895 with front-drive, $35,895 with AWD. Comparable SX models are $5,000 more and add such standard equipment as 19- instead of 18-inch wheels, chrome trim, FlexSteer, leather upholstery, rear air conditioning, rearview camera, the navigation system, and premium audio. The top-line SX-L with all the aforementioned comforts and conveniences has a base price of $39,195 with front-drive and $40,995 with AWD. The ’14 was released in early 2013 and the ’15 goes on sale in the first quarter of 2014. More precise steering would make it more enjoyable to drive. None of the three settings gives you much connection with the road and surprisingly, only the feather-light Comfort setting provides linear response through turns. And while the four-cylinder LX model accounts for only about 10 percent of sales, there’s room to improve its fuel economy to make it more attractive.